A couple of weeks ago, Aron Meystedt of Heritage Auctions emailed me because his company is brokering the sale of the two letter OC.com domain name. It’s a nice domain name made valuable because it is a two letter .com, and “OC” could stand for Orange County, among many other meanings (or nothing at all). Because of the OC acronym, it looks like the domain name is getting some good local coverage in Orange County. You can have a look at the article in the Orange County Business Journal (found at OCBJ.com). I also embedded a copy of the print edition, so you can see how it looks to readers who receive the paper version of the publication. 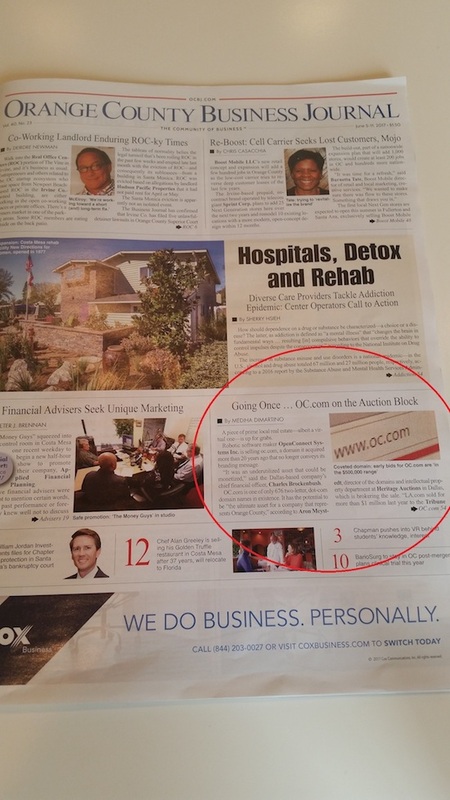 The OCBJ is a weekly journal, and the article about OC.com was on the front page and appears on the website’s home page. I don’t know how effective an article in the local business publication will be when it comes to selling this high value domain name, but I presume the coverage didn’t cost the auctioneer anything, and it is hitting one aspect of the target audience. Domain owners, brokers, and other domain sellers can use this coverage as a lesson about marketing their domain names for sale. Sometimes the fact that a particular domain name comes up for sale is noteworthy enough that it will get news coverage right in the target market with no marketing outlay. I presume Aron made a contact within the editorial department of the OCBJ and the information he shared was deemed to be pressworthy. This one is a high value domain. If I were the owner, I will not take less than $10 million. But that’s just me. Some schmuck will probably let it go for a few hundred K’s, but that’s why they’re called a schmuck. “OC” does indeed evoke Orange County. A highly populated, highly affluent county. Plus it plays itself popular culture. Think of all the TV shows and movies. But the caveat is that it’s neighbor to the north (LA!) get’s all the attention. In that sense, OC pales in comparison to LA. So….as a domainer, you know where to go. Where the money is. Orange County, Calif is very affluent area of the U.S. But, there are other places that could use OC. I doubt they could afford buying it. Plus, some companies could use it too. The price is absurdly low and people are taking advantage of it by lowballing if any of those offers are real. This is also what happens when you serve up extreme Kool-Aid by saying the $1.2 million sale for LA.com was a good sale when it was plainly only pennies on the dollar. Something is worth what someone is willing to pay. You only need to sell/buy one. It is not enough that other domains are similar. There are many tesla’s coming off the assembly line. What would CO,com be worth? I agree that one can under pay or over pay for something (in our mind). But, that is in the mind of the beholder as what is the base price. Just an assumption of what ” WE ” are willing to pay. The market AT THAT MOMENT will determine its current value.